Lorton Auto Service Center can maintain your vehicle in accordance to the manufacturers recommended service levels and comply with manufacturers warranty at a fraction of the cost of what the dealerships charge. If you want the same service as performed by your vehicles dealer without the large price tag, then ask us to carry out a vehicle factory recommended service. (30k,60k, 90k, etc) Prices are vehicle and mileage specific. Lorton Auto developed this unique flexible service by combining many of the requirements of the top ten auto manufacturers including Mercedes, BMW, GM, Ford and Lexus and packaged it into an affordable flexible package suitable for any vehicle. The service will replace and exceed almost any manufacturers requirement and only needs to be done once every 12 months or 12k miles. The Lorton Performance Flex Service includes but is not limited to a Mobil 1 oil change, tire rotation, top-up of all fluids, lube chassis parts, battery and charging system service, computer diagnostics and a 44 multi-point inspection which includes breaks, suspension, lights, AC, etc. 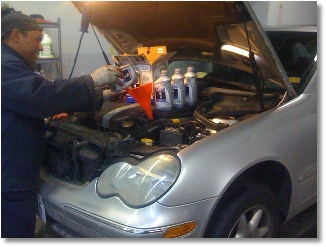 It is the finest and most economical service for your vehicle. If you want your vehicle to have absolutely the best, and extend its life to the maximum we recommend our SES (Synthetic Everything Service). Price and coverage is vehicle specific but typically includes changing the following fluids to synthetic :- Engine oil, brake fluid, transmission fluid, power steering fluid, differential and transfer case fluid and replacing the coolant with a long life non corrosive alternative.